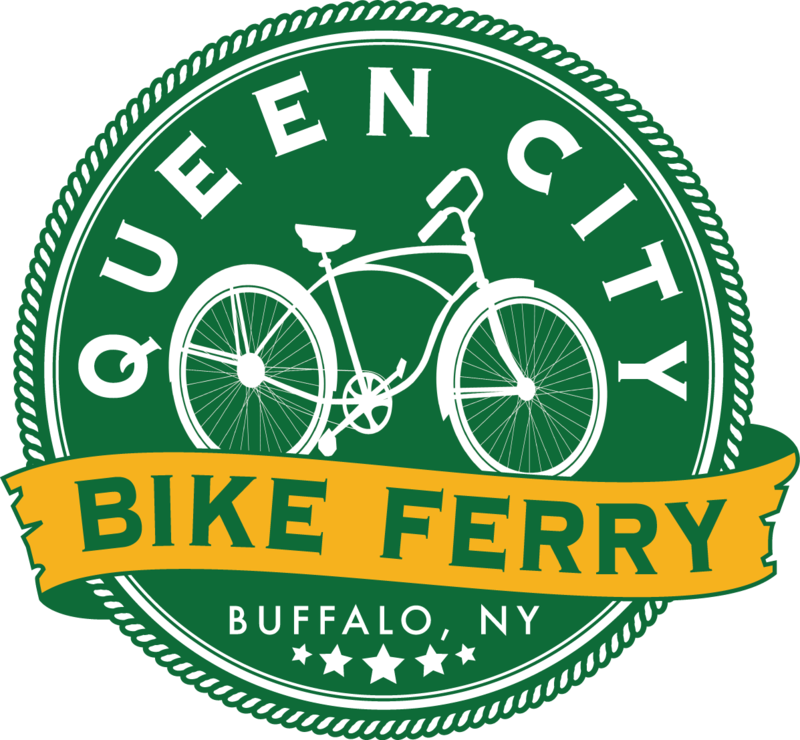 Queen City Bike Ferry is a link between Buffalo's inner and outer harbor. 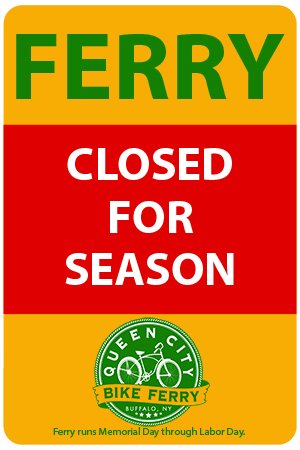 The ferry service for bicyclists and pedestrians will run daily beginning Memorial Day and will operate through Labor Day. Boardings cost $1 per person each way, including bicycles. The vessel can hold up to 49 passengers and 25 bikes at a time. One way trips takes five to ten minutes to complete between the Commercial Slip at Canalside and the Bike Ferry Landing on the Outer Harbor. It is a straight shot about 600 feet across the Buffalo River. From Bike Ferry Landing, passengers have walking access to Wilkeson Pointe Park, Times Beach Nature Preserve and the Chinamen’s Lighthouse. For bikers, destinations include the Greenway Nature Trail, Buffalo Harbor State Park, Charlie's Boathouse Restaruant, Outer Harbor Playground, Tifft Nature Preserve, and the Outer Harbor Bike Trails. 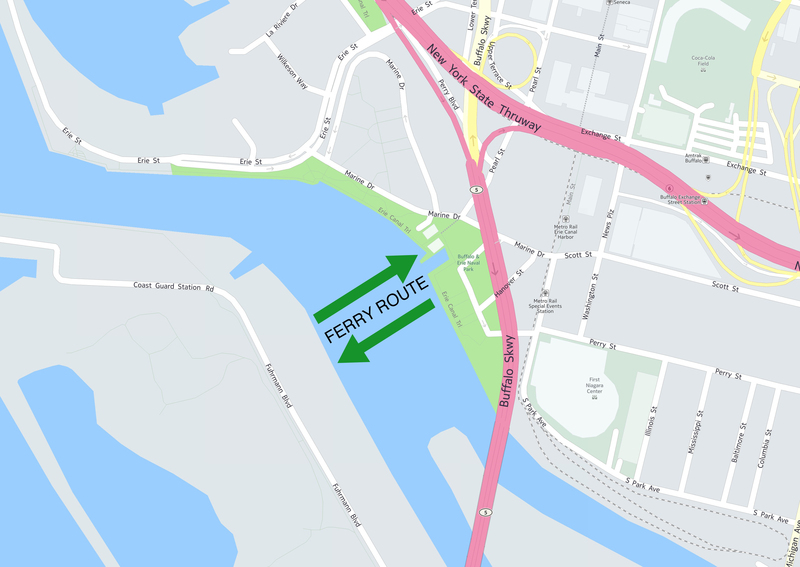 The last trip to the Outer Hartbor departs from Canalside at 7:30 pm and the last trip back to Canalside departs the Outer Harbor at 7:45 pm daily. *Ticket vending machines are located at each stop. One at Canalside at the foot of the Commercial Street Bridge. And one at the Outer Harbor Ferry Stop at the base of the water tower. The machines accept credit cards, singles and quarters. Exact change is required. Fare includes bike.